The financial crisis rocks the banks, even though the French banks have been generally less affected than those in the United States and in England, having lost a total of “only” 19 billion euros due to subprime mortgages, and even realizing juicy profits in 2008, about 10 billion for the sector. In addition to which AIG, thanks to its federal bailouts, has reimbursed the French banking sector to the tune of some 20 billion. Recession, here again, is less than the European Union average, but nonetheless 1.8 percent predicted for 2009. The most heavily affected sectors are real estate and construction, which together are likely to lose 30,000 jobs this year, while they had gained 350,000 jobs over the past ten years. As for the automobile industry, there are over a million jobs in this sector. The sales of the French auto makers (PSA and Renault) were down 8 percent in 2008. In this sector 202,000 full-time equivalent jobs had already been lost during the years 2004-2007. Since then the French auto makers have been producing the majority of their cars outside of France, reserving for the French plants the top of the line vehicles, the first to feel the effects of the crisis. In the electronics sector, equipment expenditures and intermediary goods have also been hit. All in all, the crisis has accelerated a process going on over the last thirty years: the contraction of industrial jobs in France from 5.5 million to 3.5 million. Many plant closings in the electronic and automobile industries (Sony, Continental) come as a windfall for the companies, accelerating the removal of production sites to countries with cheaper manual labor. The characteristics of the crisis in France, thus, are not at all unique on the economic level, their effects being even weaker than in other European countries. But, compared to other countries in the European Union, the social and political reactions over the past few months have been livelier. This is, of course, attributable to features present in French social relations for decades which lead to a rapid politicization of all social questions. But this also results from the particular context in France since the election of Nicolas Sarkozy to the presidency of the Republic in May 2007. On the eve of that election, the two dominant parties, Union pour un Mouvement Populaire (UMP) and the social democratic party, Parti Socialiste (PS) were largely discredited for their respective politics in the preceding governments, the politics of which had largely been at the expense of the working classes. The two principal candidates (Segolene Royal and Nicolas Sarkozy) presented themselves similarly as providential candidates, emancipated from their parties, and playing a populist tune. Sarkozy had the nerve to base his campaign on the claim that “I’ll be the President of [increased] purchasing power.” And in fact, the first months of the Sarkozy presidency seemed in line with the image the right sought to project of its victory: a total drying up of the political terrain of the Front National, the extreme fascist-leaning right, by a law-and-order and anti-immigrant politics which were no better than the program of the National Front’s founder and president, Le Pen, on these issues; a quasi-bonapartist stance by Sarkozy, who sought to appear as a popular tribune feigning to bring solutions to social inequalities; a marginalization of the traditional left, KO’d after its defeat in the presidential election, but above all incapable of regaining its feet in the face of Sarkozy’s onslaught. The paralysis of the PS was such that it was unable to react to the integration of several well known socialists in the government, including at the head of the list, Bernard Koucher, as minister of Foreign Affairs, and the satellitization of several others, notably Dominique Strauss Kahn, pushed to the International Monetary Fund. The PS reaction echoed the lack of substantive discord between the UMP and the PS during the electoral campaign on numerous social issues, economic issues, and issues of international politics. Sarkozy gave the impression of occupying all by himself the terrain of his political majority, leaving only marginal issues to his ministers. He neutralized political opposition on his right as on his left, while multiplying initiatives on all fronts. FUNDAMENTALLY, HIS FIRST ACTS were in thorough allegiance with the propertied classes. In the summer of 2007 he championed fiscal measures granting 15 billion euros of gifts to the richest: a “50 percent shield,” that is, a total tax limit to 50 percent of income. This measure had been in effect since 2006 but with a 60 percent ceiling. Added to this was elimination of inheritance taxes on real estate purchases, a new reduction of the tax on large fortunes. At the same time the government refused to activate the “coup de pouce” — the annual July 1 tradition of a raise in the minimum wage, which benefits 17 percent of wage earners. The Sarkozy campaign’s slogan in regard to wage earners was “work more to gain more.” Populist demagogy addressed to the “France which gets up early,” it was given concrete form in a law exempting overtime work from social deductions. Purely ideological, this measure obviously didn’t increase wage earners’ buying power. The injury was compounded with the arrival in the summer of 2007 of the subprime crisis. The beginning of the economic recession in 2008, even before the explosion of the financial crisis, led to a renewed increase in unemployment, notably as a result of the non-renewal of “contrats interimaires,” contracts for temporary workers. Parallel to these fiscal measures, the government, in concert with the French employers association, Mouvement des Entreprises de France (MEDEF), pursued its neoliberal offensive, seeking to place France in unison with the rest of Europe in dismantling public services, public systems of social protection (health, retirement), and the protection of workers’ contracts. 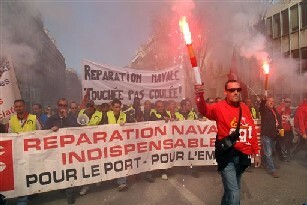 The French labor movement has a political stake in the current situation. It is at the same time weak and dynamic: weak in the total number of members (6 percent to 8 percent on the average, depending on the sector, with only the public sector exceeding 10 percent); strong in the real activity of shop stewards in the work sites, a dynamic union culture, and broad confidence of French workers in the unions, despite all that has been diminished over the past twenty years. The stake for the employers is thus to see social relations in the workplace evolve towards a system broadly implemented elsewhere: to suppress conflict by more broadly pre-empting the unions, reducing the instances of conflict to top level global negotiations held directly with central office delegates, and rendering local struggles led by shop stewards with the direct mobilization of workers more or less inconsequential. In fact, the basic play of the government and employers in recent months is in their capacity to move the Confédération Générale du Travail (CGT ) toward these orientations. The CGT, formerly linked to the Communist Party, is the main French labor confederation. For a long time the CGT was characterized by union struggle, engaging in direct conflict with management and asserting, in opposition, the interests of wage earners. Along with many of its European equivalents, like the Workers Commissions of Spain or the Italian General Confederation of Labor, the CGT in recent years has drawn closer to that sector of the union movement oriented towards neoliberalism, represented by the European Trade Union Confederation (ETUC) , dominated by the large German, English, and Scandinavian unions. FOR TWO YEARS NOW, the government has thus espoused a politics openly in service of the propertied classes, symbolized by the tax shield, but followed by other measures, such as the recent retraction of the professional tax, a local tax imposed on businesses according to their income.The government has just repealed this tax, thus delivering a new gift of 7 billion euros to employers. But at the same time it has sought, along with the MEDEF, to assume a position in the social dialogue while shutting out the labor movement from its reforms, as the right and employers have succeeded in doing in other European countries. 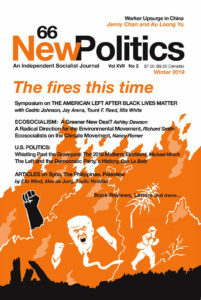 The crisis has thus hit France with society in turmoil, with a president in free fall in the polls, having lost the confidence or its electoral base for exacerbating social inequalities, and having alienated by its successive reforms a large number of social sectors — with the exception of the capitalist elite, all too content to have a President so devoted to its interests. What’s more, all the measures taken since September have been perceived as just so many provocations. While the government claimed the state coffers were empty in respect to social security and the replacing of functionaries, in just 48 hours it found 428 billion in lines of credit for the banks . . . but without any concrete means for wage earners to access credit, or measures to combat unemployment and the closings of businesses . . . and with an obstinate refusal of any measures to increase the buying power of workers. Anticapitalist sentiments, already quite noticeable in France, have been reinforced by the occasion of this crisis and augmented by a real discrediting of Sarkozy and the government. It’s widely understood that business leaders and the state don’t want the crisis to be the occasion for a questioning of the wealth accorded over the past twenty years to capital, or to guarantee jobs and good wages by imposing another relocation of surplus value. This explains the very lively reactions to the closings of a business like Total which listed profits this year of 14 billion euros and to plant closings as at Continental near Compiegne, where workers at the French factory of U.S.-owned 3M held their boss captive to protest planned layoffs. These are the latest sign of growing public anger at rising unemployment in France.This also explains the growing popularity of the anticapitalist left, with Olivier Besancenot and the Nouveau Parti Anticapitaliste formed in January. Despite this broad discontent, it was not until January 2009 that the union confederation called for a day of general strike, bringing out 2.5 million demonstrators in major French cities. The force of discontent was such that all the unions, even the least combative, were obliged to sign on for the strike. January and February were obviously marked by the general strikes of Guadeloupe and Martinique. In addition to local demands, due to the colonial heritage suffered by the Caribbean populations, the wage demands echoed those of wage earners in France. The demand for a 200 euro net raise seemed legitimate to mainland workers. And to manage to assert this demand by means of a 6 week strike served as an impressive example. But of course there is hardly any comparison between the union leadership of Guadeloupe and France. It took almost six weeks for another day of general strike to be called . . . on March 19. Here again, despite the delay, the number of workers on strike and in the street was even larger than before — 3 million, with 70 percent of the population according its support to the movement. But the question posed in the aftermath of this event is evident. How can this force be mobilized to effectively get the government to yield? Because the union leadership doesn’t want a real test of strength, doesn’t want a national struggle on the scale of Guadeloupe, for that reason the only new call given to the strikers of March 19 is . . . May 1st! Let’s hope that in the cities and among the mobilized workforce, like those in the auto industry and national education, the combative workers will impose other imperatives. LÉON CRÉMIEUX is a French airline technician, unionist, and political activist. He is membership of Solidaires Unitaires Démocratiques (SUD) Union and involved in the national leadership of the New Anti-Capitalist Party (NPA). ‹ Are U.S. Unions Ready for the Challenge of a New Period?